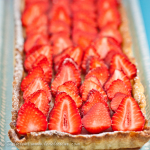 Inspired by Donna Hay's Strawberry & Ricotta Tart from Seasons: The Best of Donna Hay Magazine. The tart dough recipe is from Dorie Greenspan's Baking: From My Home to Yours. The tart dough will be enough to make 2 tarts. Leftover tart dough can be wrapped in plastic wrap and frozen.